Russian bases in Syria came under the wave of armed drone attacks in January 2018. The targets were Russian air and naval bases. It is a new wave of terror strikes on military installations. The drones were locally assembled with a GPS guidance system to control and direct these drones to the desired targets. The technology is available and drones can be manufactured with local resources that could either have pre-fed target coordinates or can be remotely controlled so that these drones can also be maneuvered to avoid detection by radars. The drones used in Syria to target Russian bases could carry 6 to 8 bombs of a pound each that would blast on impact. 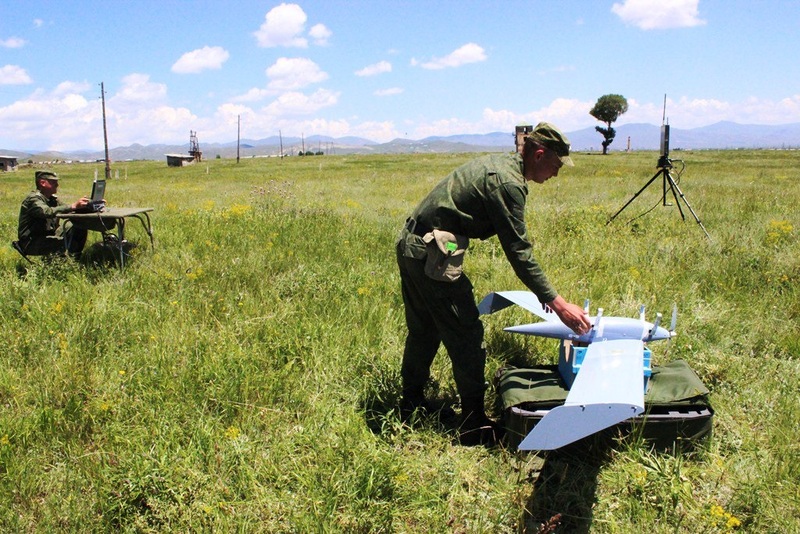 It did cause some damage but Russians were able to detect most of the drones well in time. Out of the 13 armed drones, seven were shot down by Russian Pantsir-S air-defence system and six drones were brought down by Russian Electronic warfare units by hacking the guidance system. Though Russia claimed that there was no damage but other sources including the US claimed that Russians suffered considerable damage and they lost two soldiers and few aircrafts were damaged. Russia has now commissioned an anti-drone unit to deal with the threat of drones equipped with powerful electronic jamming systems. The potential of drones to cause damage is huge. These drones can be used for espionage, destruction of military and nonmilitary targets. These armed drones can be used to collide with the aircrafts and can also be used for communication and live surveillance over sensitive areas. Drones have the potential to undertake multiple tasks during war and even during preparation for war. The drones being used by terror organizations have the range up to 25 to 50 km. David Axe an American Military correspondent stated that “For years, Syrian rebels and Islamic State militants have been using consumer-style drones costing around $1,000 apiece to spy on rival forces, drop small bombs and conduct suicide attacks while carrying explosives.” Peter W. Singer, a drone expert and author of Wired for War, said. “Robotic swarming is a huge deal and has an unprecedented threat to military and nonmilitary targets”. The threat of drones is not only to the military targets but also to nonmilitary targets such as VIPS, airports, refineries, radar stations, air traffic control, communication towers and even the gathering of the people during festivals or national functions such as 15 August and 26 January parade. The military targets can range almost all types including the company operating basis in counterinsurgency and counterterrorism affected areas. There is a need to evaluate the threat and identify areas that would require anti-drone protection. Fighting the menace of drones require high-end technology to keep the area around the potential targets under constant surveillance so that adversaries are not in a position to carry out sneak attacks on potential high value targets. Proactive kinetic weapons are required to bring them down before they reach the objectives and also high-end electronic warfare capabilities to hack them or take control of these drones while in flight. There is a requirement of having radar or UAV cover to detect low flying drones the moment drones are airborne. In addition drones equipped with surveillance and electronic warfare equipment may also be required with long endurance to keep an area of potential launch pad of drones under surveillance. However, these drones can be launched from rooftops and even from large windows. Surveillance/ electronic warfare drones should be equipped with surveillance cameras, sensors and jammers to detect and immobilize these predator drones. Similarly, it is not important that only armed or spy drones should be destroyed but there is also a requirement to engage the drone attackers or the operators after having ascertained the requisite evidence of the attacker on camera. There is a requirement of multiple anti-drone systems to destroy the predator drones before they reach the target. Long range anti-drone missiles with proximity fuse that could cover a wide area with fragments of the warhead is an effective anti-drone system. Radar controlled anti-aircraft guns are useful to shoot the drones, however, these guns have limitation and if the drones are flying at low level, in that case, it is very difficult to pick up the predator drones. Drones that can collide with the predator drones well away from the target areas is another option, however, it would require radar controlled maneuver. There is also an option to destroy the drones by electromagnetic pulse that could be mounted on drones, UAVs, helicopters or even on the ground or on a high mast. Drone net is another option to prevent drones hitting the targets. The net can be used to cover the target or net can be underslung with another drone so that the predator drone gets entangled with the net while flying. The passive measure to neutralize drone threat is to use jamming of the GPS system of the drones and also disrupting the command that may be given to the onboard system by the controlling station. There is also a requirement of acquiring base stations if the drones are being controlled remotely so that even those can be neutralized. Hillary Schaub and Darrell M. West wrote in Brookings that, “Drone Defender is a device that emits an electromagnetic field meant to disrupt the most popular GPS and ISM radio frequencies, which keep drones in the air. The Drone Defender can then take control and guide the drone safely down to the ground”. Even the trained eagles can be employed to keep the skies safe and they can bring down the predator drone. However, it would require training of eagles that may not be so easy in a large area. Swarm drone attacks are becoming more and more potent and unrestricted access to the technology of drones in the commercial market is further compounding the problem of such a threat. Even the commercial drones with little modifications can be remodeled for any of the above tasks ranging from espionage to delivery of bombs on to the target. The government may even be required to make a law for restricting the sale of drones in the open market considering the threat it poses to the military and nonmilitary targets. Possession of drones should also become unauthorized if held without a license. Every drone sold in the market must be accounted for so that it does not get misused. The threat from the swarm drone attack is real and it can only be handled by technology.